We offer the equipment and ability to service drain lines from 1 1/2” through 36” in diameter clearing lines of grease, sediment, roots and debris. With our 50 HP diesel tow behind Jetters we are able to provide intense cleaning of lines 3” up to 8”. We have an array of different specialty jet heads that allow us to emulsify grease, remove scaling and cut heavy root intrusion with out destroying the pipe. These Trailer Jetters provide 18 gallons of water per minute at 4000 psi and have a reach of up to 500 foot. We rely on these for our root cutting and prepping of lines before relining pipes and also for the restaurant and maintenance contracts we provide. We use our CombinationVac and Jet truck for Heavy Sanitary and storm drain and sediment cleaning. We are able to clean out a distance of 550’ and remove heavy silts, grease and debris. Our vacuum is able to effectively lift with a 8” bore to depths of 25’ or more. We provide regular service of different Treatment Plants vacuuming and cleaning pits, filters and stations to remove build up, sludge and debris. We have a built in boiler system on the truck which allows us to cut heavy grease build up off of pumps, floats and basin walls. Our Combination truck is equipped also with a separate water pump system, boiler and remote controls which allow us to be able to efficiently cut through hard soils and around delicate and sensitive utilities with out damaging them. We are able to simply and effectively pot hole vacuum excavate down to these different utilities and get a visual depth of the lines without damaging them. Tv’ing of Sanitary and Storm Sewer Lines for Leak and Infiltration location. With our camera systems we can visually survey lines from 2” up to 48” diameter and distances up to 1000’. We also provide recordings and locating abilities to pin point problems in a line from above the ground. With our tractor crawler system we can drive the camera up the lines from the remote location of the control room and with a fully motorized pan and tilt head we can provide a real time read out of the conditions in the lines and pin point infiltration and leaks. With our Lateral launch camera we are able to survey areas normally unaccessible to crawler cameras. The lateral launch camera is like the tractor crawler camera in that it allows us to drive up the line and view things that way but with the lateral launch system we can line up with the intersecting line and launch a separate camera up that line another 140’ or so. This allows us to check the condition of the laterals without needing to enter the home. With our Jetter and Camera combo we can pull a small camera through lines 6” and down which aren’t accessible with a Tractor Camera and distances of up to 500 + feet. We can also locate from above the ground and find out depth and location of the problem section as deep as 10’ – 15’. 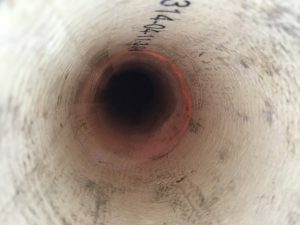 We provide specialized pricing and the ability to meet the requirements necessary of pre and post visual locating of lateral sewer lines when boring new gas lines in. We run the main sanitary and launch up each lateral and mark its depth, location and depth where it crosses the drill path. After the new gas lines have been installed we provide a post survey to assure lateral sewers haven’t been damaged. We offer the ability to seal off leaking concrete manholes and tanks by using a chemically mixed liquid grout which we pump into the open voids behind the manhole at around 1500 psi and seal the leak from the back side. This grout expands rapidly when it comes in contact with moisture and successfully seals off the leaks. We also have a product we use on heavy gushing leaks which within seconds seals off the flow and allows the rest of the smaller leaks to be sealed of with the other liquid grout. We have used this product with a very high level of success on manholes and other water tanks and vessels. With our Trenchless bursting systems using cable and solid steel rods we can burst lines of many different sizes. Bursting allows us to not only replace a line with one of equal size bust it also gives us the option to upsize pipes from it original size to a larger diameter pipe size. The process of pipe bursting is accomplished by pulling a special expanding head through the existing host pipe with hydraulic power and attached to the expanding head is the new HDPE pipe which is pulled in place at the same time as the old line is broke out. Once the new line is pulled through there is a seamless new high density line that is ready for immediate service. With the process of Trenchless Slip Lining we are able to pull a new HDPE pipe through the existing line and eliminate the need to excavate the old line out. After the new line is pulled in place we fill the void between the two pipes with a concrete liquid grout. Unlike the bursting method, this process does not replace the old line with one of the same diameter but has to downsize the pipe size. but because of the high flow capacity and low friction loss of HDPE pipe the new drain line can usually handle more water than what the original concrete or steel one could. Trenchless relining is the process by which we are able to build a completely new seamless pipe under the ground by following the existing hole of the existing host pipe. We are able to repair and completely replace lines as small as 3” and as large as 36” in diameter. The process starts with running a camera down the existing pipe to check its present condition and verify it is a candidate for the relining process. Once that is confirmed we will usually need to prep the existing host line by cleaning it of debris, sediment and any root growth. Then we will get a measurement of the overall length of pipe that we want to reline and the transfer those measurements over to the liner that we will be inserting in the pipe. We use the inversion process of relining which allows use to use only one access point to reline the pipe. This eliminated the need to have two pits dug and allows us to insert a liner all the way out to the city or county main without needing needing to excavate the sanitary main or street. The liner is built out of a two part resin mix and the end result is a seamless pipe from beginning to the end. After new line inserted and resin is cured it is ready for immediate service. 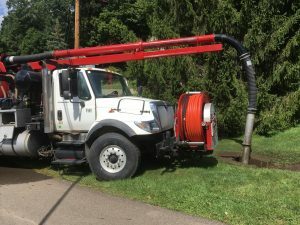 With our pit boring equipment, using our PD6 and PD2 we are able to bore new water and sewer service lines in relatively small areas of access. We are able to bore from the house out to the street or from the street back up into the house. The digital steering allows us to know grade, pitch and location of the bore head at all times and direct it to the target area. Once the route has been bored we are able to up size the hole and pull back new water services or on grade sewer laterals. Our Pit bore systems use a static push bore process that uses raw hydraulic power with solid bore rods which allow us to maintain an even grade in a relative small area with very little room needed for set back. Depending on soil conditions we can pull back lines up to 8” in diameter.